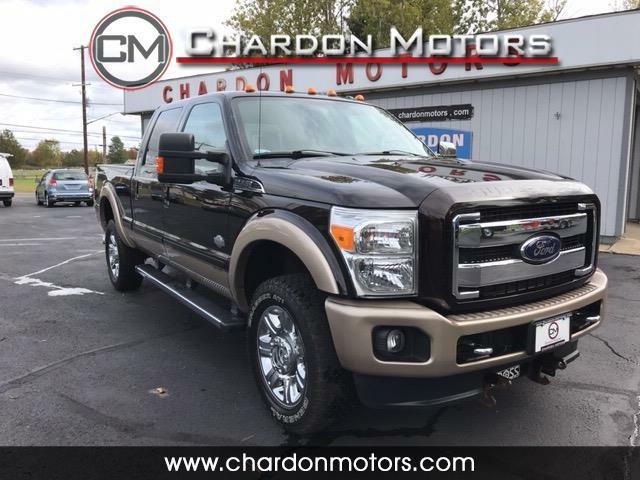 2013 Ford F-350 Super Duty King Ranch 4x4 Offered by Chardon Motors. This is a CARFAX CERTIFIED truck. 6.7L DIESEL - 400HP/800 FT/LBS TORQUE! SADDLE LEATHER INTERIOR/HEATED SEATS/STEERING WHEEL CONTROLS/BLUETOOTH/MOONROOF. $4000 less than NADA book and $2000 less than market average price! Drives great. All stock. Electronic Locking Axle, King Ranch Package with Chrome, 20" Cast Chrome Clad wheels, Heated Rear seats, snow plow package, roof clearance lights, Factory Navigation, dual auto climate, and too much more to list. Freshly serviced and ready to go!